The above illustration is a piece of work from Remarker, the Hungarian visual facilitator team who created the drawings at the conference where I first encountered this topic. Geoff Ball wrote “Explicit Group Memory”, an early paper in the field of graphic facilitation. He discovered that a shared picture supported group learning or, more importantly, a lasting memory in the group. So creating some kind of visual, graphical imprint of a meeting can help participants better understand problems and recall the agreed decisions. Graphic facilitation of meetings comes in different flavors. As a note-taking method, it helps a group memorize the contents of a presentation or discussion (as the speakers at the conference did). In this case, however, the facilitator only focuses on the drawing and usually it takes more effort and years of experience because they work in real time during a meeting or presentation. It can also benefit day-to-day workshops or meetings, as I saw years later at UX Studio. Prepare and create visual posters and helping materials to go with the topics beforehand. Then complete these half-done posters with your team. How does this improve a ppt or scribbling on a whiteboard? We all usually do agendas or summaries and all sorts of visualizations for meetings on computer or whiteboard. Creating paper-based drawings gives participants a completely different feeling. More effort into workshop material will stimulate your team to also put more effort into the meeting. 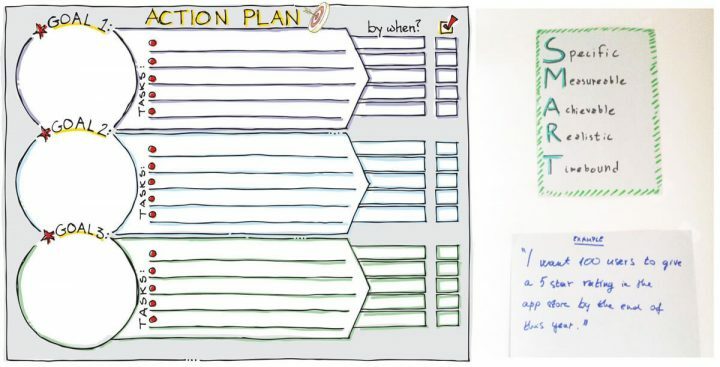 Creating them on paper also lets you post the most important ones later on your team’s wall or to keep them in front of the team during the whole meeting. I know we all love to say this. We’ve just gotten too comfortable with our super smart devices and totally forgotten how to use a tool as simple as a pencil. You don’t need art training to start graphic facilitation. Just practice some basic forms and learn the basics about visual hierarchy. Your team will really appreciate it even if your first materials don’t win awards. Creating materials by hand for the first time may take more time than creating a ppt, but it certainly pays off. Furthermore, you don’t have to create complicated and fully decorated designs the first time. After practicing some basic lettering and shapes a bit, you will draw them easily and much faster. So no more excuses, let’s see how you can start right now! Don’t run to the nearest stationer’s right after deciding to try out visual facilitation. You certainly have some old markers and some brown wrapping paper lying around the office or your home. As a beginner, just use whatever you find around you. 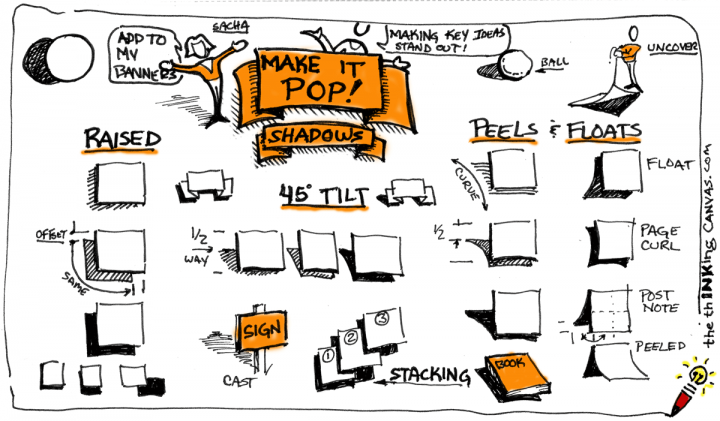 Visual faciliators know Neuland well. If you plan to take this to another level, perhaps to do professional visual facilitating or to impress a new client, buy some new markers. Refillable markers work the best, they harm the environment less and come in a greater variety of colors. 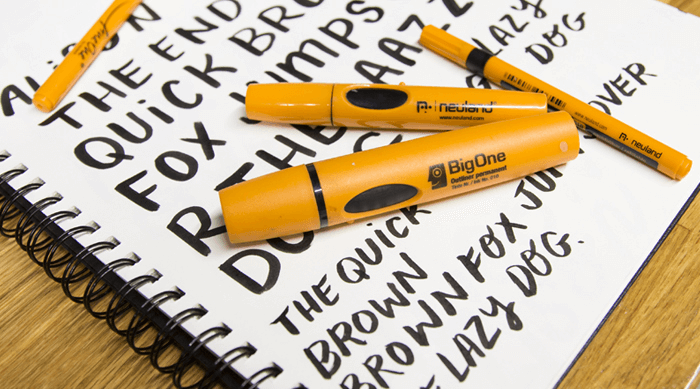 Facilitators rank Neuland markers the best, though they don’t come cheap. You can also find markers with two different ends, which can prove very useful.The thin end writes letters and draw small details, while the thick, brushed one does coloring, shading or creating bigger shapes. Sharpie or Copic also have a wide variety of refillable markers, also with different ends. Four or five different colors, including black and grey (for shades) suffice. 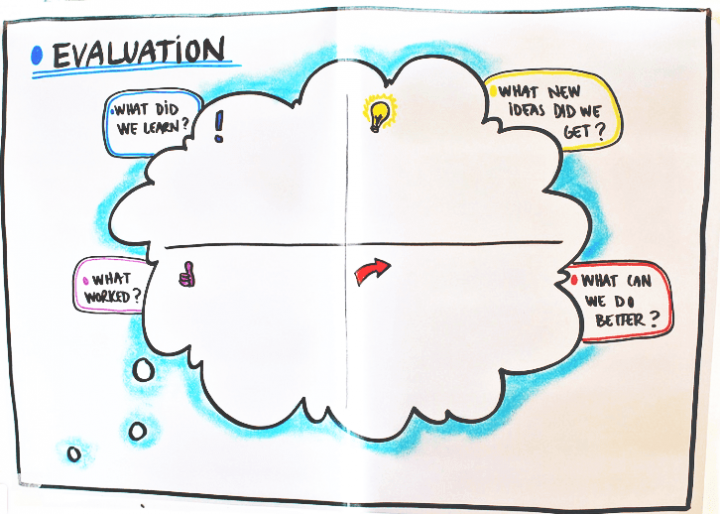 What to pay attention to during graphic facilitation? How to write text better? When first starting with graphic facilitation, you will quickly realize written text greatly influences your works. So practice how to create legible, well positioned handwritten texts. The order in which a reader processes information on a page forms the visual hierarchy. A well built hierarchy allows readers to understand information easily. Form it by assigning different visual characteristics to sections of information, e.g., larger, bolder fonts for headings or more space around elements which belong together. While creating materials, always pay attention to creating some kind of hierarchy. Emphasize the important things, and use smaller letters, paler colors for the less important parts. As a basic rule when writing, do not use your own handwriting. We usually don’t write very legibly but rather tend to focus on speed. Also try out different fonts when writing. Don’t immerse yourself in hand lettering; three different fonts will suffice. I practice a kind of all-caps with some letters more like lowercase and a “beautified” version of my handwriting sometimes. Experiment with different font weights or even slanted letters for a challenge. But remember, the letters don’t have to reach 100% perfection! Also use different shapes and containers to make your materials even more readable and interesting. Highlight different sections, group pieces of information with these boxes. All sorts of materials abound online for great examples. Several books also cover this well, such as “Bikablo – the facilitator’s dictionary of visual language”, a must-have resource for all those deeply interested in graphic facilitation. After a few rounds of practice, these forms will embed themselves in your muscle memory, letting you recreate them very quickly. Use shadows to make containers “pop out” even more. You don’t have to make shadow studies of objects or dive deep into this subject; just copy some good examples. 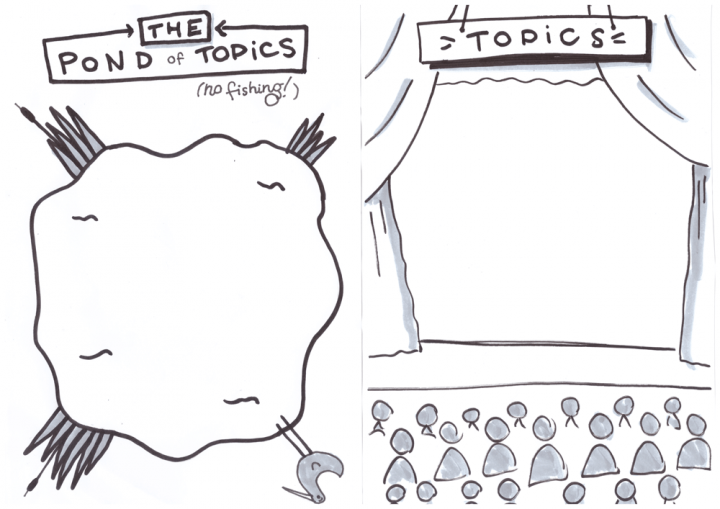 It may sound boring, but copying proves very useful for improving graphic facilitation. Later on, your own distinctive style will emerge and the principles learned while copying will serve as a great knowledge base. 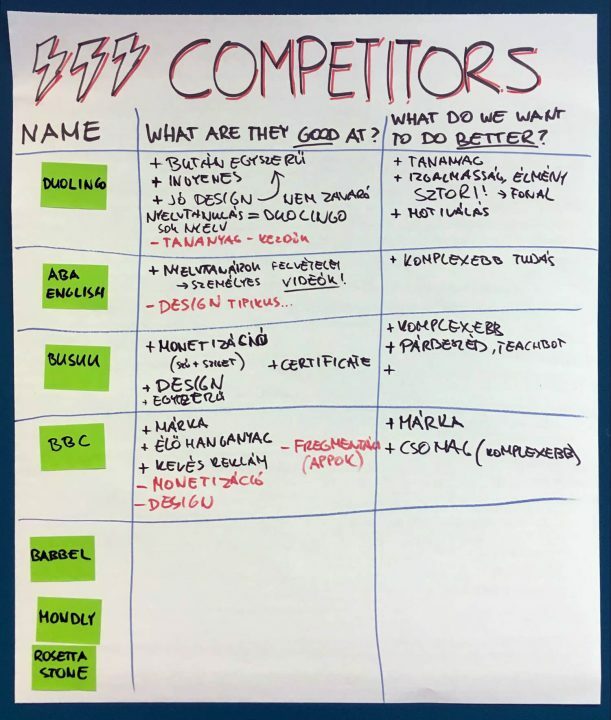 Use different templates for different workshops and meetings, depending on the subject you plan to work on with your team. 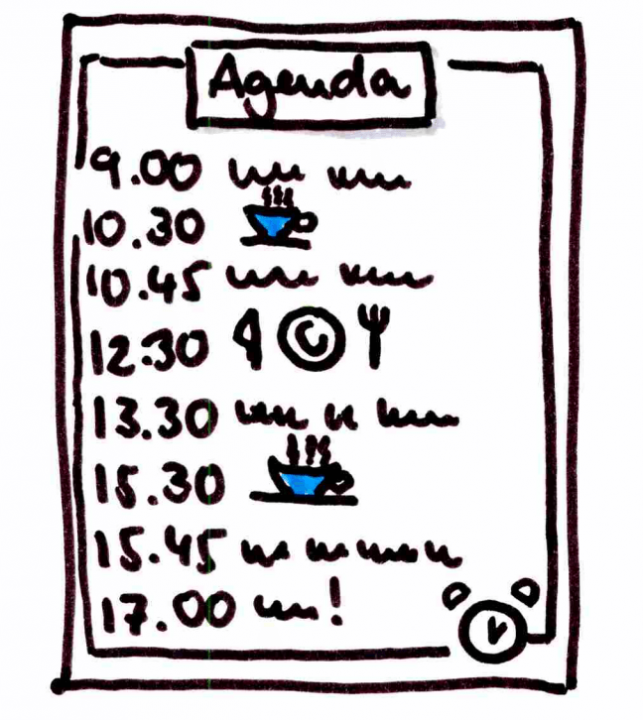 A quick list for a day-long kickoff or UX workshop will give participants fixed points. Always stick an agenda to the wall for easy reference. Plus, you can draw cute cups for the coffee breaks! 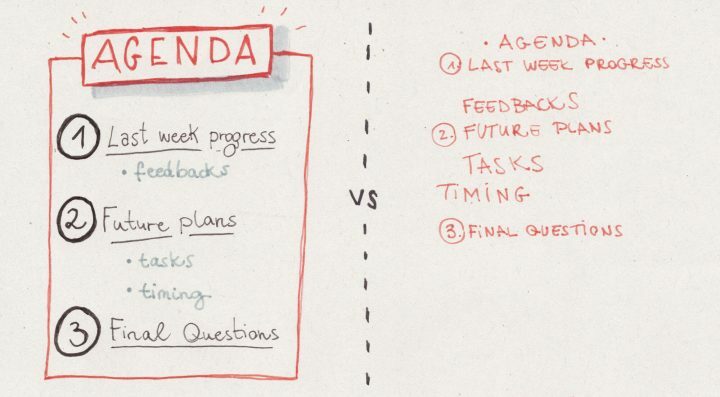 If you have a meeting where the agenda depends on the participants, use templates to collect suggested topics and ideas. Gathering pros and cons can have also different visualisations, making the outcomes more memorable. Setting up achievable goals and realistic tasks can prove difficult. This template will make setting up clear tasks for the goals much easier. The S.M.A.R.T. method helps set realistic goals. You can easily get lost in details during competitor analysis or discussions. Using a template while gathering insight (from clients or researchers in your team) clarifies the main differences for the whole product team. 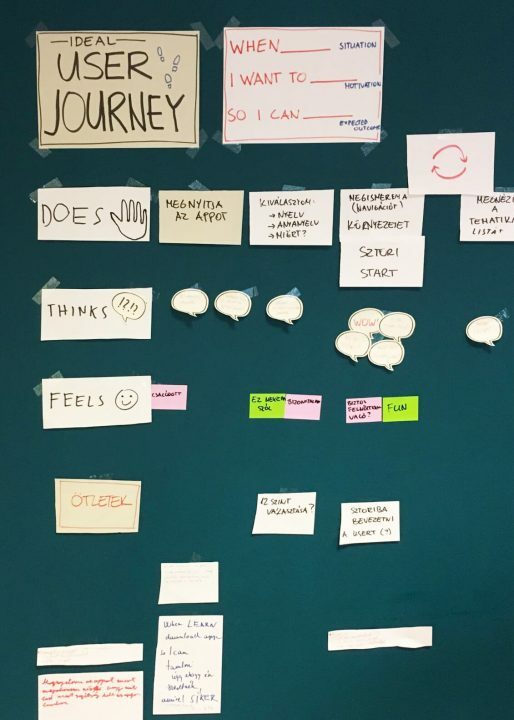 Gather the learnings of a sprint or project and measure success using templates like this to get a better understanding of your product team’s experiences. Starting graphic facilitation from zero can prove frustrating, but fortunately here come some great ways to practice! Start taking notes by hand whenever possible! I started a few months ago in our team’s weekly client meetings. Instead of popping up notes on my Macbook, I just grab a piece of paper and go. I especially pay attention to the visual hierarchy and decorate if I have the time. I also create grocery lists like this. Copy, copy, copy! Look out for resources and try to remake them. I know it sounds boring, but you will make a lot of progress! Whenever you have to make a workshop, retrospective or kick-off meeting, try to create at least some of your materials by hand. You will feel the difference! 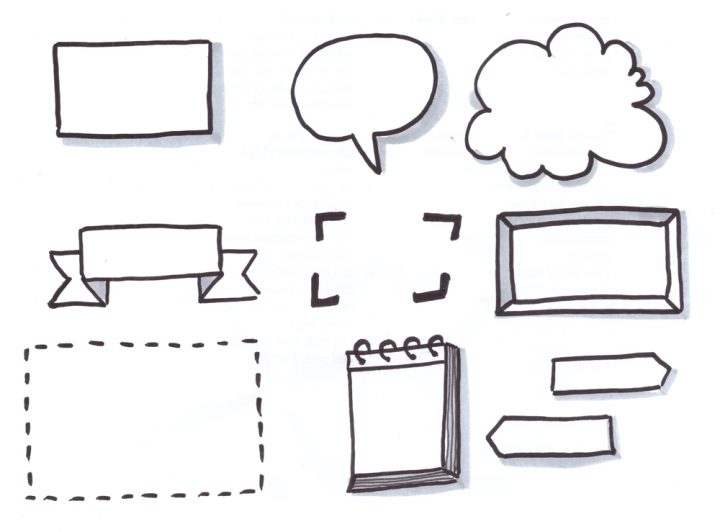 One more addition: I really like this video from Verbal To Visual about visual note taking. Already in the habit? Any questions or suggestions? Let us know in the comments! 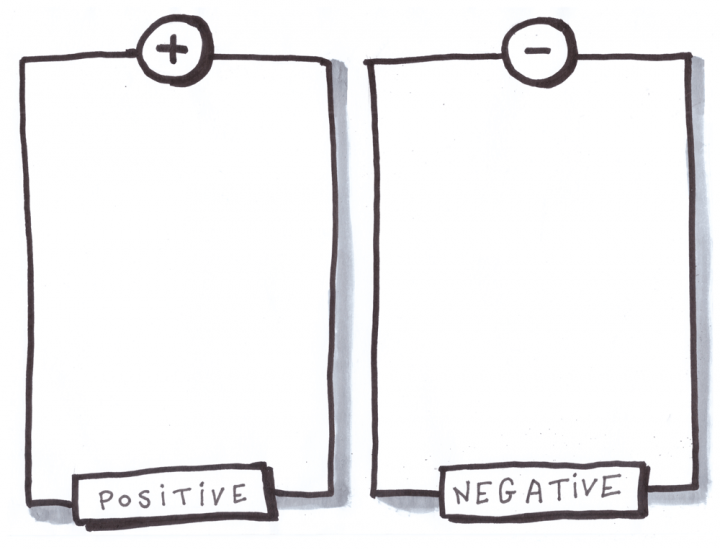 Tell us about your methods and motivators for practicing visual facilitation.